– Advanced Firewall protection detects fake, spam and attacking users and protects your website. Indeed, it cannot be blocked by Google or other search engine detections and does not harm your website in terms of SEO. Real-time firewall protection works according to the two options; one is blocking attacks when it is detected and the other one is checking it with reCAPTHCA. You can arrange these settings with Prevention Method System. – In admin panel of plugin, you can review your website’s status and plugin settings. – Ultimate Firewall is coded as compatible with 100% translation into other languages. – With the admin report system in the admin panel of the plugin, you can see the IP address and login time of the last user that logged in to your web site; and you can get email notification when an admin log in the admin panel in order to maximize your security. – With the email notification system, you can receive emails for hacker attacks, Brute-Force attacks, Proxy Attacks, Spam attacks and spam comment attacks. – Instead of making security changes one by one, you can set your security level automatically from the admin settings section, or you can ensure your security by using special settings. – You can prevent attacks to your website whether by blocking the access or by using strong reCAPTCHA protection. – Via Uptime Robot API you can monitor your website in details. It requires free Uptime Robot account. – Both protect your website and at the same time speed it up. 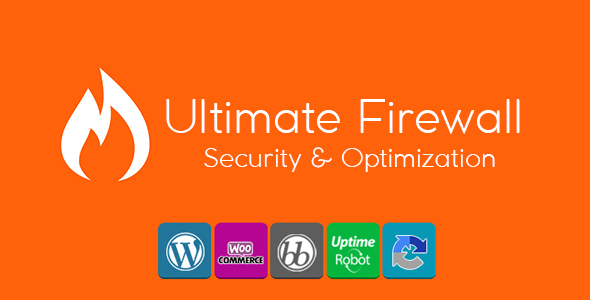 Ultimate Firewall plugin provides also speed increase service besides the protection. – Prevent HTTP attacks to your website via HTTP Security Headers settings. Enables X-Content-Type-Options, X-XSS-Protection and X-Frame-Options in your server. – Prevent WordPress based attacks by disabling XML-RPC and REST-API. – Disable the file editing feature in the WordPress admin panel. – With the advanced reCAPTCHA protection, protect WordPress comment section, login form, membership form and password reset form with reCAPTCHA. – Start protecting your comments with Honeypot or reCAPTCHA, and prevent spam comment attacks immediately! – Prevent your content from being stolen with the content protection system. And it’s also compatible with Google! – To be protected from WPScan, you can activate the version hiding system and prevent the deficit on your website from being detected. – You can prevent people who log in your website through tor browser or servers. – You can prevent people to logging in your website by using proxy or a free VPN software. – If an attack is made to your website, by enabling this setting you can check first time users through reCAPTCHA control. – By SQL Injection Protection, you can provide protection against bad (virus) bots and fake search engine bots. – With access security settings you can block IP address, country and User Agent information. 1.0.1 - Turkish Language added. The related information is provided in the admin panel in order easy configuration of the plugin settings. For any questions, comments or suggestions, please send an email to info@divcoder.com.